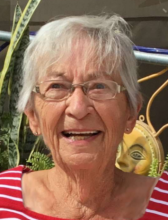 Marjorie Elaine Hansen, the daughter of Einer K. and Esther (Andersen) Jensen, was born March 10, 1933, at her parents’ farm near Audubon, Iowa and died February 4, 2019, at the Salem Lutheran Home in Elk Horn, Iowa at the age of 85 years, 10 months, and 24 days. Marjorie was baptized and confirmed at Our Saviour’s Lutheran Church in Audubon, Iowa. She attended Audubon Community Schools graduating with the High School Class of 1951. She then helped her parents operate the Jensen Motel. On December 11, 1954, she was united in marriage to Willis Hansen at Our Saviour’s Lutheran Church in Audubon. They were blessed with three children, Scott, Robin, and Kari. They moved to and lived on Willis’s family farm. Marjorie helped Willis operate the farm where they grew row crops and raised livestock. Marjorie always had a large garden and enjoyed canning the produce. Marjorie also enjoyed raising dogs. They moved into Elk Horn in 1984 and retired from farming in 1992. In 1980, they started traveling south for the winter. They wintered in Brownsville, Texas for several years and later traveled to Winter Haven, California. Marjorie lived at home until she moved to the Salem Lutheran Home in June of 2018. Marjorie was a member of the Elk Horn Lutheran Church. One of Marjorie’s greatest passions was painting china. She and Willis loved traveling south and enjoyed antique collecting. Preceding her in death were her parents; her brothers Leroy and wife Joyce Jensen and Marvin Jensen; her sister Arlene Koons and her husbands David Fenske and Chet Koons; and her sister-in-law Darlene and husband Lyle Hansen. Survivors include her husband Willis Hansen of Elk Horn, Iowa; her children Scott J. and wife Ann Hansen of Nunn, Colorado, Robin and husband Patrick Dull of Solon, Ohio, Kari and husband Kurt Duitsman of Pearland, Texas; her grandchildren Danielle and husband Adam Heath of Orange, California, Jacob Dull of Washington, D.C., Katie Dull of Orlando, Florida, Dana Dull of Solon, Ohio, and Ashley Hansen of Colorado; her great granddaughter Josie Heath of Orange; her brother Eldon Jensen of Heber City, Utah, sister-in-law Jean Jensen of Audubon; nieces, nephews, other relatives and friends. The family will meet with friends on Monday, February 11, 2019, from 10:00 a.m. until time of the service at the Elk Horn Lutheran Church in Elk Horn, Iowa. A Celebration of Life Memorial Service will be conducted by Pastor Keith Menter on Monday, February 11, 2019, at 11:00 a.m. at the Elk Horn Lutheran Church in Elk Horn. There will be a private inurnment at the Elk Horn Lutheran Cemetery. The honorary urn bearers will be Danielle Heath, Jacob Dull, Katie Dull, and Dana Dull. The family prefers memorials to the Salem Lutheran Home in Elk Horn. To plant a tree in memory of Marjorie Elaine Hansen, please visit our Tribute Store. "Email Address" would like to share the life celebration of Marjorie Elaine Hansen. Click on the "link" to go to share a favorite memory or leave a condolence message for the family.